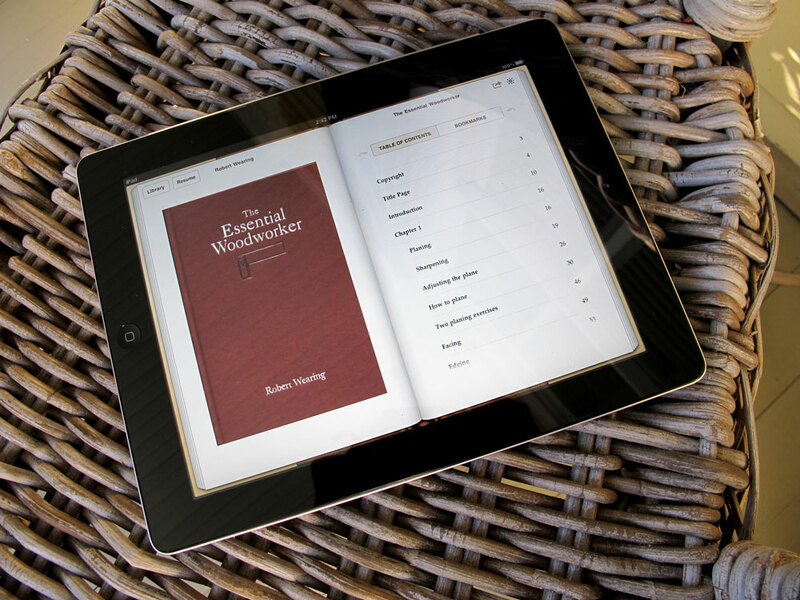 You can now download the ePub edition of “The Essential Woodworker” by Robert Wearing in a completely DRM-free format for your iPad, iPhone or other electronic reader that supports .epub files. Click here to visit our store and purchase the ePub edition for $10. A Kindle edition of “The Essential Woodworker” is in the works and will be released shortly. The ePub version of the book follows the format and layout of “The Essential Woodworker” version published by Lost Art Press. We reset the entire book in a classic typeface, incorporated changes from Mr. Wearing and laid out the book in a classic 6” x 9” format. This is an authorized reprint by Mr. Wearing. With every purchase of the electronic or physical version of the Lost Art Press book, significant royalties go to Mr. Wearing. In our opinion, “The Essential Woodworker” is one of the best books on hand-tool usage written in the post-Charles Hayward era. Wearing was classically trained in England as a woodworker and embraced both power and hand tools in his shop and in his teaching. The book “The Essential Woodworker” was written to remedy the lack of fundamental hand-tool knowledge in the post-World War II woodworker. While Wearing discusses basics such as sharpening and tool use in the book, the true genius of the book is in how Wearing shows you how to apply all the tools and processes to actually build things. He begins with a table. As you read the chapter on building a table, Wearing connects the dots for the hand-tool user by showing how all the tools are used in concert to produce accurate work. It’s not just about sawing a tenon or planing an edge. Instead, it is about how to gather these skills and apply them to building furniture – tables, doors, carcases, dovetailed drawers, plinths etc. The book is filled with more than 500 hand-drawn illustrations by Wearing that explain every operation in a hand-tool shop. His illustrations are properly drafted, drawn in perspective and masterfully clear. For a tutorial on how to manually add a book to your iPod or iPhone, view this tutorial on our blog. It’s easy. This entry was posted in Downloads, Products We Sell, The Essential Woodworker. Bookmark the permalink. Excellent news.Waiting for the Kindle version (hopefully before Christmas). I assume it will be the usual procedure for non-US purchasers (i.e., via e-mail). I couldn’t agree with you more. As the original editions become more difficult to locate, it’s great to see Mr. Wearings treatise on hand tool woodworking returned to print. To place an international order, send $10 (U.S.) to john@lostartpress.com and we will send you a link to download the file. You don’t need to wait for the Kindle version, you can use Calibre (http://calibre-ebook.com/) to convert from epub to mobi, which the Kindle reads. Can use http://www.epubread.com/en/ to read it on your PC. http://www.epubkindle.com/ will also help you get your addiction now! Enjoy! Thank you so much for making epub’s available!